Read the Guildford Dental Blog for tips and advice on dentistry and information from our dentists about dental treatment options at our Surrey Dental office. Flossing is important for your oral health! 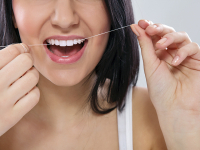 If you'd like to do a better job flossing, here are some tips to help you along. You can probably guess that an implant-supported denture is supported by, and attached to, a dental implant. Here's a little about how implant-supported dentures work. Sleep Apnea has a number of physical effects on the body, but many people don’t realize that it can also have a negative impact on mental health. When purchasing an electric toothbrush the type that you choose is mainly down to personal preference. However, there are a couple of features most dentists recommend to their patients. 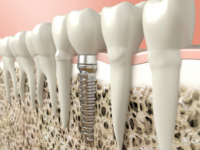 Our patients frequently ask us if the implants will feel like natural teeth. 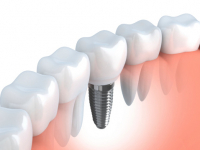 Implants are a popular tooth replacement option because they give wearers a natural look and feel. But exactly how do they really feel? Is using mouthwash an essential part of a good oral hygiene routine? Mouthwash can help rinse away food debris and bacteria after brushing, but it's not an essential part of a good oral hygiene routine. 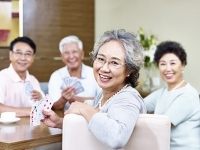 Dental implants are dental restorations that replace missing teeth. Implants look, feel and act just like natural teeth, and with proper care can last for decades. As you near the end of your Invisalign treatment, chances are you’'ll been giving a little thought to what happens next. Here’s what to expect once your treatment is complete! Here’s how you should prepare for a safe and successful appointment if you're scheduled to undergo dental treatment under sedation. Invisalign Teen aligners are removable, so that patients can take them out to eat, drink, and care for their teeth. This can make it tempting to remove them more often than prescribed… and that’s where compliance indicators come in. Once you have had professional teeth whitening done on your smile, you’ll probably want to keep it looking bright! Here are a few tips on how to keep your smile white after teeth whitening treatment. If you are considering Invisalign for your orthodontic treatment, you may wonder what impact the aligners might have on your ability to speak. Here, our Surrey dentist offer their top tips for getting used to speaking with your Invisalign aligners in your mouth. With dental implants, you can replace a single tooth, multiple adjacent teeth, or in some cases, a full upper or lower jaw of teeth. You don't necessarily need a separate implant for each individual tooth, however. Here's how it works. Our dentists at Scott 72 Dental Centre in Surrey often recommend electric toothbrushes to help patients do a better job cleaning their teeth. Here's why electric toothbrushes have an edge over manual ones. If you have had a tooth extracted, getting the space filled as soon as possible is very important in maintaining your long-term oral health. 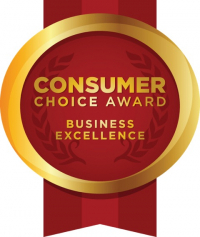 There are several tooth replacement options you can choose from. At Guildford Dental, our Surrey dentists advise against teeth whitening for children for a two very important reasons. Invisalign is less conspicuous alternative to metal braces for straightening your teeth. Read on to learn how long you can expect your Invisalign treatment to take. At Guildford Dental, our Surrey dentists provide oral sedation for patients who feel nervous about their dental treatment. Here’s how the process works. There is a wide a range of over the counter teeth whitening products available, but professional whitening systems are safer and more effective. Here, our Surrey dentists explain why. Continuous Positive Airway Pressure (CPAP) is one of the most effective sleep apnea therapies out there. Here, our Surrey dentists describe how CPAP works, and how it can help you get a better night’s sleep.